Go to Manage. This will take you to the Manage Forums screen. Click on the Title of the forum whose topics you want to make gradable. Scroll down, and under Forum type, select “Reply Only”. This will ensure that students don’t start new topics, but rather reply to your prompt. While on the same page, scroll further down and choose “By Topic” under Grading. Be sure to click on Save at the bottom to save your changes. Now, click on Discussion Home in the top menu and go to the forum whose settings you just adjusted. Click on a topic that you want to make gradable to open it, and click on Edit. The Edit window will open (see below). Add dates, points and minimum number of posts required, enable grading, and choose to send scores to the gradebook. Dates are optional. You may add dates to any topic, as long as no parent dates are set at the category or forum level. Topics do not need to be gradable in order to have open and due dates. You may set dates to any topic. 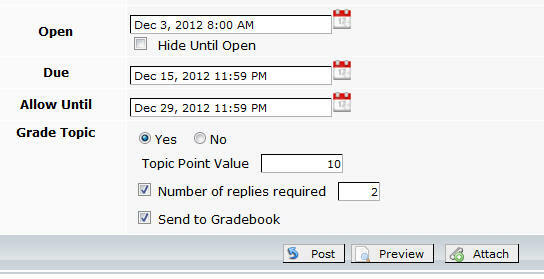 If Grade Topic is set to “Yes” then you may add Topic Point Value and the minimum Number of replies required. If set to “No”, these selections will be “greyed out”. You may also set the number of replies required. Check ‘Send to Gradebook’ to ensure that the topic is listed in the gradebook. You may uncheck or check the ‘send to gradebook‘ setting at any time from any of the views where it’s available. The change will propagate across the various views where the topic is displayed and in the gradebook. When grading, instructors can see the number of posts that they required and compare it against the total number that students contributed to a discussion.